Stir in the oats and liquid to a pan over a low to medium heat. Add half a banana, a small handful of strawberries, cinnamon and a squeeze of maple syrup. Stir continuously until the oats are fully cooked and creamy. Meanwhile slice the other half of the banana. 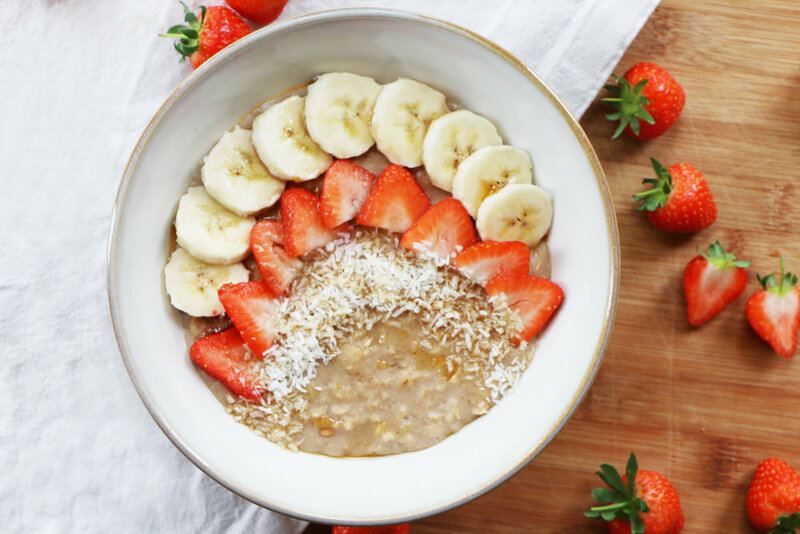 When the oats are cooked, add to a bowl and top with the banana, strawberries and some desiccated coconut. This is one of my all-time favourite combinations for oats. It reminds me of petit-filous yoghurts I had when I was little. I think the combination of banana and strawberries makes it that extra bit creamy! This would also taste delicious with any berries!